Just in time for Mother�s Day our new line of small folding pocket mirrors are on sale and we are offering a free upgrade to express shipping to help ease speed up the ordering and delivery process. 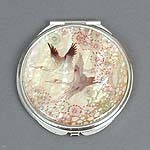 Sixteen new styles of mirrors done in elegant mother of pearl include butterflies, the Rose of Sharon, which is the Korean national flower, sparrows, and the Pair of Cranes mirror shown, which represents immortality, and a happy marriage since cranes are believed to mate for life. See all the new mirrors and other new items here. All the new mirrors are on sale for 25% of the regular price and we are offering a free upgrade to express shipping for all orders of $50 or more through the May 7. More details here. Most traditional Korean holidays are celebrated on the lunar calendar and so change on the solar calendar each year. Buddha�s birthday is determined by the Lunar calendar and falls on 4/08 but changes every year on the solar calendar. This year it will be on 5/02 on the solar calendar. 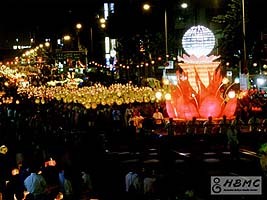 Preparations for the event begin several months in advance by decorating many of the major streets with strings of lanterns. The week of the birthday there are generally a number of events leading up to the day and this year include a lantern lighting festival in front of city hall, lantern making festivals at most of the Buddhist temples, and in downtown Seoul in front of Jo-gye-sa (one of the largest temples and the largest Buddhist sect in Korea) a Buddhist street festival. 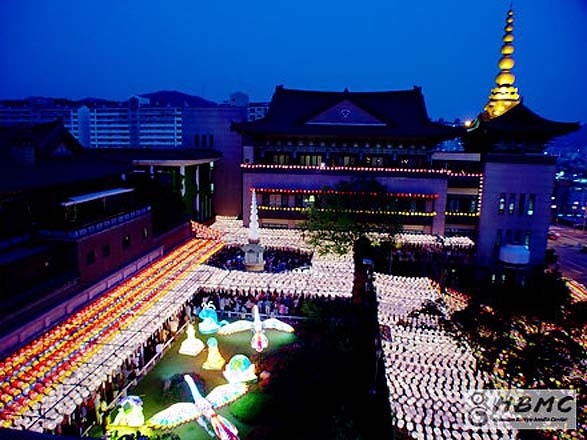 The day of Buddha�s birthday the temples are decorated with thousands of lanterns and are lit at night. 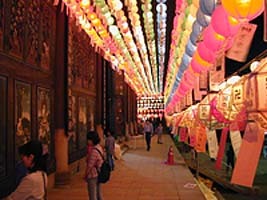 Scores of people visit the temples throughout the day and into the evening to pray, see the beautiful lanterns or simply partake in the atmosphere. Traditional Korean food and rice wine is also served on the grounds and contribute to the pleasant atmosphere. Up until several years ago, the lanterns were lit with real candles and walking under them was quite an affair as the hot wax would drip onto ones head with each gust of the wind. Nowadays, electric lights are used and the event is a bit safer, although not such an adventure. 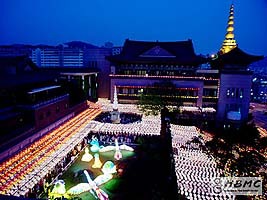 See more pictures from the Buddha�s birthday celebration at Jo-gye-sa temple here. �Buddha�, was born as a prince in Northern India in about 563 BC (some scholars disagree on this) as Siddhartha Gautama, the son of King Shuddhodana and Queen Mayadevi. India was at that time a Hindu society in which reincarnation was accepted and it was thought life on earth was but a series of reincarnations. The goal then was to avoid the endless series of reincarnations, and the suffering that accompanied them, and achieve Nirvana. Into this society, Prince Gautama was born and raised in a life of luxury, married and had a son, and led a normal life up until the age of twenty-nine at which time he left his home to become a religious wanderer (a common practice at the time). He studied under several masters during that time and engaged in fasting, often to near death, to achieve a higher level of meditative enlightenment. Finally, one day while meditating under a tree, later known as the tree of enlightenment, he achieved a state of enlightenment, said his rebirths were over and stated that he had entered Nirvana even while in his present life. He had become the �Buddha�. He spent the remainder of his time spreading word of the path to enlightenment. His doctrine, and path to achieving Nirvana, says that existence is an evil and can be eliminated by getting rid of desires of life and things of sense. By achieving this state in which there is a complete lack of desires and practicing the eight precepts of the way to Nirvana which include in part, celibacy, the practice of good deeds, and contemplation, one can achieve Nirvana at, or even before, one�s death. Early Buddhism was introduced into Korea at the end of the fourth century from China but took on a unique style of its own under the early rulers of the royal court who used the religion as a faith of national defense and prayer. They also consolidated the various sects which had not been accomplished in Chinese Buddhism. Due to Buddhism in Korea being tied to the royal court, in the late eighteenth century, the Japanese used the introduction of their style of Buddhism and their temples into Korea as a political tool to aid in the eventual annexation of Korea which occurred in 1910. To this day there is a rift amongst the sects of Korean Buddhism which was caused by the introduction of the Japanese sects. Korea currently is about 26% Buddhist, 26% Christian, 46% no affiliation and 2% other. 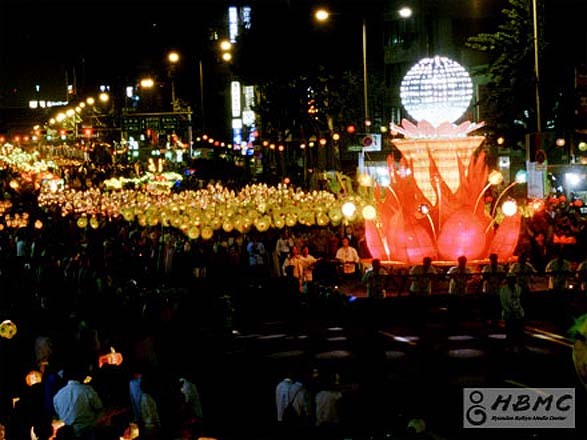 Although, only 26% of the population is Buddhist, many more than that enjoy watching the lantern festival and partaking in the other activities associated with the Buddha�s birthday celebration much like many non-Christians celebrate Christmas in the West.